From the front of the choir: Why don't you sing songs from India? Why don't you sing songs from India? Well, the simple reason is that India doesn’t have a harmony singing tradition, and that’s pretty much what I’m about. The same goes for most other countries in Asia. I’m also asked why we don’t do more Islamic songs. Well, there are many groups within Islam that take the view that the only music that can be made is the call to prayer. Some groups extend this slightly to include devotional songs with words from the Koran. 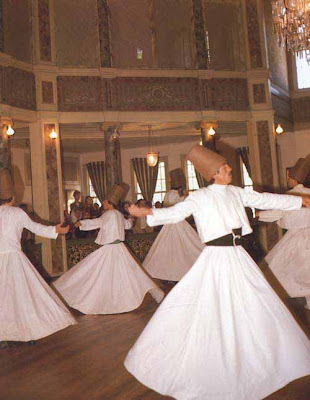 At the other extreme, the Sufi tradition uses music much more than most other Islamic groups. But still the songs are not in harmony. I’ve often thought of taking a course in ethnomusicology since I’ve always found it fascinating that some cultures have harmony singing traditions whereas others don’t. I was once told by an ethnomusicologist that there is a country in Eastern Europe (I forget which) divided in the middle by a major river running East-West. The cultures to the North of the river have a harmony singing tradition, whereas those to the South don’t! I was told that if the story in a song is important (i.e. the lyrics are the most important part of the music), then the melody tends to be quite simple with no embellishments and no harmonies which might get in the way of the telling of the story. This is evident in, for example, the English ballad tradition. Conversely, those songs which have complex tunes, rich harmonies and many ornamentations tend to have very, very simple lyrics. It is the sound of the words that is important in these cases, not the meaning. For example, the many versions of Mravalžamier from Georgia, most of which have just the one word: mravalžamier. Apparently there was a strong harmony singing tradition in Britain way, way back, but none of it survives. The more recent harmony singing traditions that we have come out of the church and have spread (via the British Empire) to Australasia and Africa amongst other places. Which is where the roots of the fantastic Maori and South African harmony singing from. I’m currently trying to source some interesting material for my new voice-theatre project. I would like to have as wide a spread of musical genres as possible, but always tend towards the traditional. So I’m really struggling at the moment whether to go with a harmonised Tamil song and an arrangement of a Sephardic songs, neither of which were originally sung in harmony. Maybe I should let go of my insistence on tradition. Or should I? By doing modern harmonised versions of songs from traditions where there is no history of harmony, am I honouring those traditions? Or am I doing them a favour by polishing up old songs and giving them new life in the 21st century? And where do I draw the line?